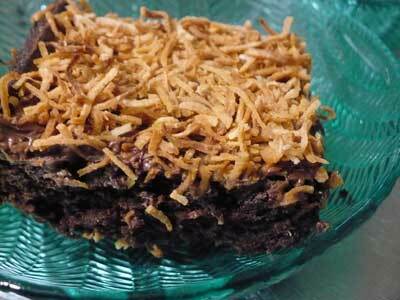 Yes, you read it right … Wheat Free, Dairy Free, Almost Carb Free Brownies Recipe that taste good! Frosting’s not usually needed. Can use nutella style spread, but is best with maybe just a bit of powdered sugar sprinkled on top by using a sieve to powder evenly. Toasted coconut is a great additional topping – as seen in the picture.